The Lincoln Nautilus is a premium crossover SUV that's designed to keep you entertained, safe and comfortable. 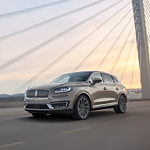 When shopping for this luxury car at Koons Lincoln Silver Spring, you can request test drives in any of the four trims that are listed for sale or lease. Featuring the all-new Lane Centering technology, the Adaptive Cruise Control reduces your risk of colliding with other cars in adjacent lanes. This high-end Lincoln also has the Automatic Emergency Braking, which comes on if you don't any action to avoid a forward crash. A washer is included in the rear camera lens that records wide-angle views of the surroundings. You can view the live images on the SYNC 3 touchscreen. Amazon Alexa is accessible in the AppLink suite that's optimized for smartphones and gadgets. You can also access the Waze app that provides reliable updates on local traffic flow on major highways and secondary roads.